1. 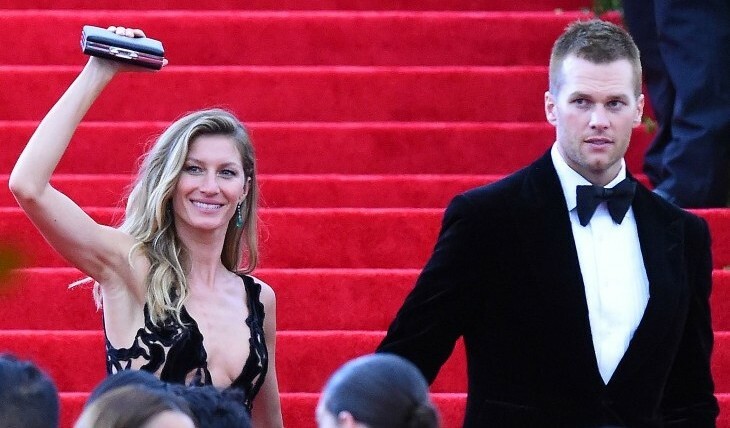 Tom Brady & Gisele Bundchen: The world’s most famous supermodel and former Victoria’s Secret angel, Gisele Bundchen, is married to NFL star Tom Brady. The two have cute celebrity babies together and live a healthy lifestyle. Frequently, she is spotted cheering him on at games, and in the past, the SuperBowl! 2. Jermichael & Courtney Finley: The Green Bay Packers football team are the best in the NFL and have won numerous SuperBowl titles. On the team, Jermichael Finley is an asset, but he also is known for being a husband and father. He’s married to Courtney Finley, and the two are one of the cutest couples who are underrated for sure. The proud parents always support one another on social media, on the field, at home and so forth. Major relationship goals! 3. Justin Verlander & Kate Upton: MLB pitcher for the Tigers, Justin Verlander, and supermodel, Kate Upton, are a pretty pair. They are our favorite engaged celebrity couple, and we can’t wait for the wedding! 4. Kroy Biermann & Kim Zolciak: Don’t Be Tardy For The Party! Kim Zolciak came into the public eye when she starred on Bravo TV’s The Real Housewives of Atlanta. She then got her own spin-off show with her husband, Kroy Biermann, who plays in the NFL. This celebrity couple is the modern day Brady Bunch! 5. Nick Young & Iggy Azalea: Rapper Iggy Azalea has been dating Nick Young, who plays for the L.A. Lakers. He’s also the cousin of hip hop artist, Kendrick Lamar. This celebrity relationship is going strong! How cute are they? 6. Stephen & Ayesha Curry: You’ve probably heard Drake rap about NBA star Stephen Curry. Does the line “Steph Curry with the shot” ring a bell? Not only is he one of the best players in the entire NBA, off the court he’s also happily married to Ayesha Curry. We love this down to earth couple. 7. Shakira & Gerard Pique: Her hips don’t lie! Pop star Shakira is known for her dance moves. However, she’s also a great wife to Gerard Pique, professional footballer for Barcelona. She’s a fantastic mother, too, and works hard. In fact, her net worth of $300 million dollars proves it. 8. Carrie Underwood & Mike Fisher: Country cutie Carrie Underwood is not only a talented singer and performer, but is also a great wife and mother. She had a celebrity wedding to Mike Fisher, professional hockey player, in 2010. Then, the couple introduced their celebrity baby boy in 2015. 9. Jessie James & Eric Decker: Country singer-songwriter Jessie James married NFL star Eric Decker in 2013. The Minnesota native plays for the New York Jets. They then welcomed a beautiful baby girl, Vivianne Rose. In 2014, they starred in an E! reality series, Eric & Jessie: Game On. 10. Ryan Braun & Larisa Fraser: Ryan Braun plays for the Milwaukee Brewers and is one of the cutest players in the MLB – hands down. He’s married to actress and model, Larisa Fraser. Who are your favorite celebrity couple athletes? Share in the comments below!